The International Association of Lions Clubs in the Greater Toronto-Hamilton Area have been involved with the Canadian National Exhibition for 62 Years. In each of those years we have sponsored The CNE PeeWee Baseball Tournament. The baseball tournament is located at CORONATION PARK, which is immediately outside of the PRINCES' GATES, (east end of the CNE grounds). Tournament details are here. Visitors may enjoy the Lions Club Snack Bar there while enjoying the tournament. The International Association of Lions Clubs will showcase "What Lions Do" durinf the CNE (dates for 2019 to be confirmed) at the Candian National Exhibition Membership Assiciation Exhibit Space located in Hall B of the Enercare Centre (formerly known as the Direct Energy Centre). Members from some of the 80 Lions Clubs in the Greater Toronto Hamilton Area will be at the booth to learn from you areas of greates needs while sharing information on our our volunteer service activities. Lions Clubs have several service focus areas: Diabetes, Hunger Relief, Environment, Pediatric Cancers and Vision. We will be asking people visiting the booth to identify which of these is most important to them and why. We are open to help address the most pressing of these with focussed projects in the near future and we need everyones input to focus our limited resources. 1. Our Dog Guide program Click Here to learn about the six types of Dog Guides. Consider supporting our next Walk for Dog Guides in suppoort of this program - Click here to find a Walk near you to donate to The booth had some 20 foster families with their Guide Dog Puppies in training as well as some dogs in service. 2. Lions Clubs support the Trillium Gift of Life Beadonor Program. Learn how you can save 8 lives with your organs (when you pass). Check if you are subscribed or change your preferences at any time online at our Lions Clubs sponsored Beadonor website - Click Here, or at your local "Service Ontario" Office. 3. A prominent Lions Clubs cause relates to Vision. As a tangible link to this cause Lions Clubs collect and Recycle Used Eye glasses of all types and provides them to qualified missions which deliver them to those who cannot afford them around the world. 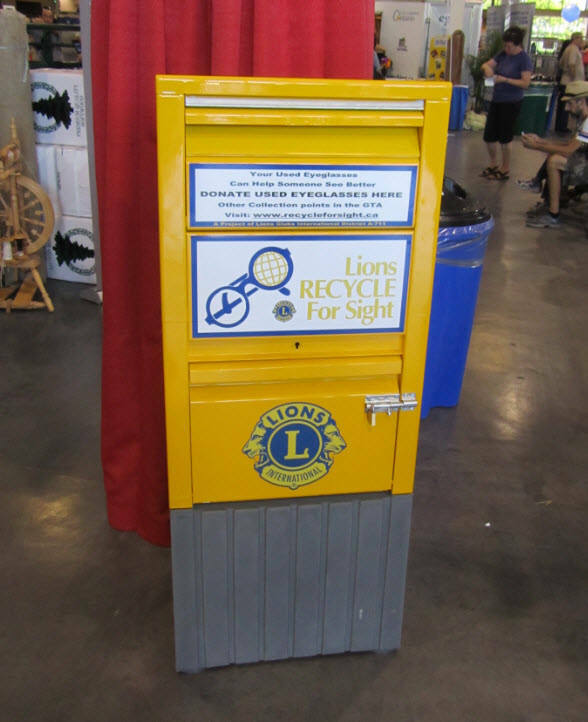 Check your drawers for unused pairs and bring them to the CNE To be placed in our "Recycle for Sight Mailbox" pictured to the left, or visit Recycle for Sight Website where you can lookup collection points all across Canada. 4. Learn about Lions Projects in your Neighborhood.